Last week, in anticipation of Shazam!’s release I put together a primer on how the film came to be, from The Rock’s almost-Black Adam solo feature to Zachary Levi’s reluctance to even read for the title role. The film is out now and WarnerMedia’s DC unit appears to have another hit on its hands. Due to Disney’s Galactucs-style swallowing of Fox as well as Endgame’s promise of a 3-hour series finale to over a decade of storytelling, there’s a lot of uncertainty right now about where certain franchises and studios are going to go next. Shazam!, however, confirms the future for DC is in idiosyncratic, filmmaker-driven standalone stories. That’s not a pressure David Sandberg and crew exactly felt while making their movie. They had no way of knowing, for example, Aquaman would take off the way it did or that The Joker would look so bizarre. There was no extra weight put on their shoulders to vindicate a philosophy change at the corporate level. Their goal was, simply, to make “Big with superpowers” in the mold of an old Amblin movie from the 80s. Let the critics try to craft a larger narrative out of the film’s success or failure. Sandberg carried over some of his Annabelle: Creation crew to Shazam!, including costume designer Leah Butler. So, while it’s now widely known Shazam! is Sandberg’s first time directing a superhero movie it was also a first of its kind for many on the crew, Butler included. This was the first time she ever had to design an actual superhero costume. What we see in the movie is modeled after the New 52 look for the character, but that doesn’t mean they didn’t explore different designs. However, they ultimately decided to stick with the more traditional costume. To make that a reality, Butler and her team 3D printed on lycra/Spandex fabric, with the metal accouterments drawing inspiration from Ancient Greek and Roman symbolism. It took 16 weeks – and countless hours from illustrators, scanners, sculptors, seamstresses, and lighting experts – to build the costume. Here, perhaps more than anywhere else is where they really felt the difference in budget between Annabelle and Shazam! The entire budget for Annabelle is officially listed as $15m; it cost $1m to create each Shazam costume and they made 10 of them! One downside: the placement of the lightning bolt and general bulkiness of the costume made it nearly impossible for Levi to even bend his body. Ahem. You meant his shot? Ah, the fantasy of being of a superhero versus the real world hassles of pretending to be one on screen. In a post-300 world, we have become accustomed to actors reshaping their bodies to fit into superhero suits rather than costume designers creating artificial muscles for them. It’s actually part of an actor’s social media strategy now, to share their workout progress on Instagram. The Rock has turned it into an art form. 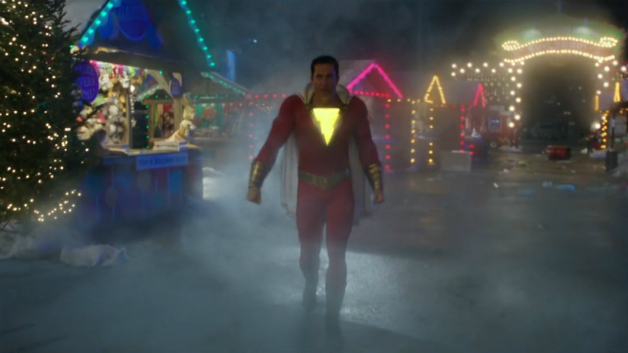 Levi, with whom costume designer Leah Butler had previously worked on Chuck, did much of the same and added pounds in muscle, but the Shazam suit still stands out as a fake-muscle throwback to a Schumacher era. Butler told BlackFilm the decision to add so much bulk didn’t come lightly. In the context of the film, the suit adds to the cartoonish nature of the story. It actually works better that he looks like such a child’s cartoon-drawing version of a superhero. When set photos leaked, though, social media didn’t see it that way. The negative reaction almost set off a mini-crisis behind the scenes. In the span of a few years, Sandberg has gone from a freelance animator who was both too old AND too inexperienced to qualify for Swedish film grants to a Hollywood director with three films to his name, one of them a blockbuster superhero throwback. His first time stepping on an actual film set was the first day of filming on Lights Out. Naturally, each new project has presented different learning opportunities. For Shazam!, one of those lessons: be sure to consider the weather when planning your entire climax around night shoots. “Both of my previous movies were shot in LA and this was shot in Toronto and a little in Philadelphia,” he told SFX. With his Scandinavian background, he thought he could handle the weather and plunged headlong into plans to stage the finale at a Christmas-themed carnival called “The City of Chilladelphia.” Pause: mad respect for the pun game. But, why does it have to be set at night? Ill health soon followed. A bout with weather-induced flu couldn’t keep him down, though. 4. SPOILER: Not Even the Actors Knew About the Big Super Family Twist. For those who don’t know their comic book lore or maybe just those who aren’t in the business of looking at early toy ads for movie spoilers, Shazam! possesses a genuinely surprising third act twist. Stop reading now if you don’t want to know the ending. In his fight against Mark Strong and the CGI 7, Billy Batson realizes the same process which gave him his powers can be repeated to share those powers with his foster family. Thus, Billly’s foster siblings – Freddy, Mary, Eugene, Pedro, and Darla – morph into their own adult superheroes played by completely different actors (Adam Brody as Freddy, Michelle Borth as Mary, Ross Butler as Eugene, D.J. Cotrona as Pedro, and Meagan Good as Darla). They give Shazam! just enough backup to beat the bad guys. I agree but only to a point. Shazam is a clever update on the familiar, but it is still ultimately a rather familiar hero’s journey with predictable story beats. With great power must also come….and all that. I like the movie, but I don’t think it’s remaking the wheel or anything. However, I genuinely didn’t see the Shazam family twist coming. I should have. The moment you see the empty chairs behind the wizard in his realm and then you see how many new brothers and sisters Billy has in his foster home you should probably be able to put it all together. But I honestly never did connect the dots. Seeing the film a second time with my niece and nephew, I felt like an idiot for having missed the signs. Even though I knew it was coming this time, the twist still works for me.